We could use your help. It's always fun around PortSide, and you usually get a great waterfront location in the deal. Folks of all ages, skill and fitness levels welcome. Next chance: this Sun 7/29/07 1-6pm, followed by BBQ. Please chip in at least two hours. We are installing PortSide’s offices aboard the tanker, so tasks include refinishing two metal desks, and moving file cabinets, bookcases, and boxes from pier to ship. If we get a lot of people, we'll do some other work on the ship (moving stuff, putting chafing gear on docklines). Wear clothes you can get dirty. Bring workgloves if you have them. Aboard the Mary Whalen. 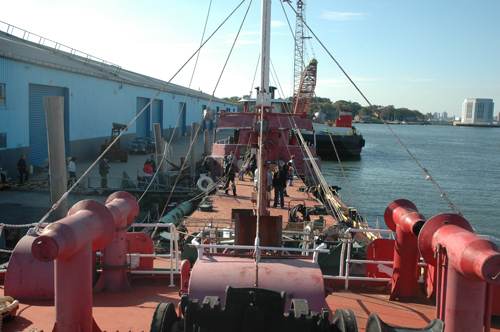 Enter gate for American Stevedoring/Brooklyn Marine Terminal at Hamilton Avenue and Van Brunt Street. Due to port security regulations, you must RSVP so we can get a list of names to the Guard. RSVP to mail (at) portsidenewyork (dot) org Bring a photo ID to show the guard at the gate. We’ll pick you up at the gate if you don’t have a car. If you've never been in the Container Port or aboard a ship docked there, donating your time to PortSide and the Mary Whalen is a great way to do it. You can check out a page on the Mary Whalen here if you're interested. Send Your Nasty Newsrack Pics to "Outrage!"